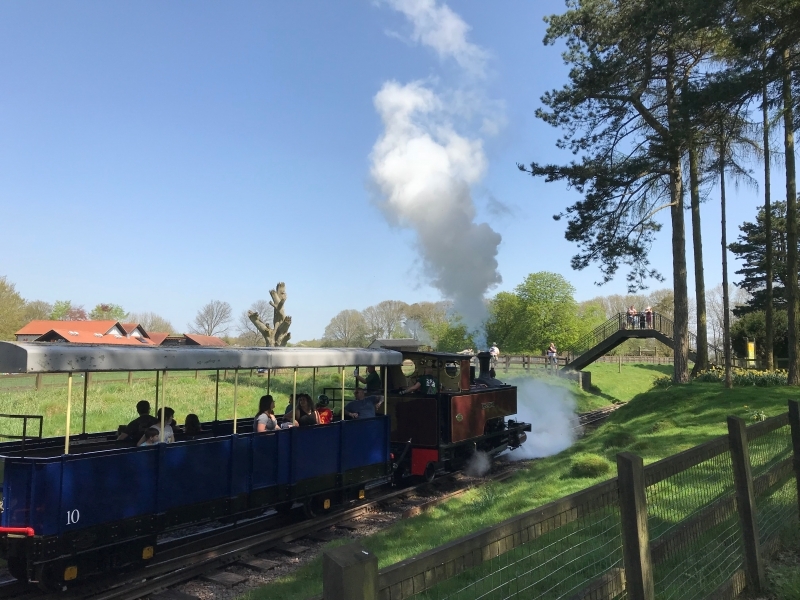 The Great Whipsnade Railway, also known as The Jumbo Express, is an English, 2 ft 6 in (762 mm) narrow gauge heritage railway that operates within ZSL Whipsnade Zoo in Bedfordshire. Construction of the railway started in 1970 and the initial line opened on 26 August 1970. The line provided rides within the animal enclosures and an additional attraction in its own right. Originally called the Whipsnade and Umfolozi Railway, it began as a short line running from near the children's zoo. It was later extended to form a loop through several paddocks. The railway is now over a mile in length. The line was primarily equipped from the Bowater's Railway (now Sittingbourne & Kemsley Light Railway) in Sittingbourne, Kent, which was the last steam-operated narrow gauge industrial railway in the United Kingdom. The railway is now equipped with four steam locomotives and five diesels (although one has been sold to the Sittingbourne & Kemsley Light Railway). All passenger trains are steam hauled and services commence at midday, with train departures every half hour with the last train departing Whipsnade Central one hour before Whipsnade Zoo closes for the day. Please give us your overall rating for Whipsnade Zoo Jumbo Express.